Piali has a couple of wonderful cards to share with you today! 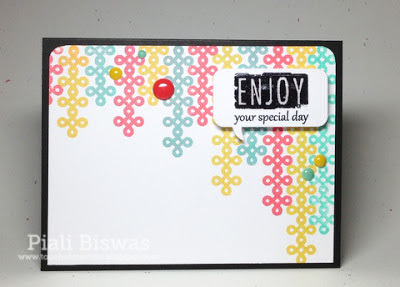 I love how she stamped the border stamp from Stop in varying lengths to get this fun streamer look. 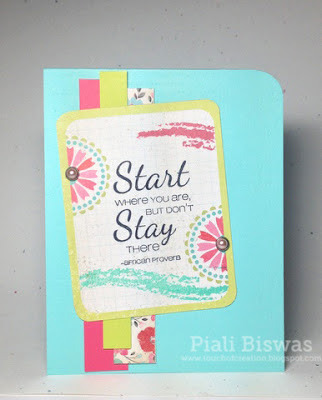 The sentiment from Mums the Word stamped inside her die cut shape adds an extra touch of whimsy. The colorful brush strokes compliment her pattern paper perfectly! I really like the simple strips of cardstock positioned behind her sentiment panel. A great way to use up some scraps, and it looks awesome! Both of these cards are simply gorgeous! Beautiful!! Love both cards so much!